For millions of Americans who have rosacea, the symptoms of the disease can be a chronic, lifelong struggle. If left untreated, the redness, bumps, and swelling can become permanent. Fortunately, there are a number of effective rosacea treatments available, including prescription medication, in-office procedures, and over the counter remedies. If you have rosacea, it’s important to understand what your treatment options are, so that you can begin the process of finding the one that’s right for you. Behavioral modifications are the first recommended course of treatment for rosacea. In many cases, making these modifications may be the only treatment needed to reduce flares and irritation. This is done by eliminating common triggers. If you’re not sure what triggers your rosacea, pay attention to when your symptoms seem the most severe. Start by eliminating common rosacea triggers such as spicy food, alcohol consumption, and hot showers. If your symptoms get better, you’ll know that you’ve identified what triggers your rosacea. It’s important to protect rosacea prone skin from the sun as much as possible, as sun exposure can worsen symptoms. As dermatologists, we recommend that our rosacea patients wear a physical sunscreen containing ingredients such as zinc oxide every day, all year round. Physical sunscreens use mineral ingredients to physically repel the suns’ rays away from the skin, and are less likely to irritate rosacea prone skin than chemical sunscreens. In addition to wearing sunscreen, we recommend that our rosacea patients avoid sun exposure by wearing a wide-brimmed hat or avoiding spending time outside when the sun is at its strongest, between 10am and 4pm. Over-the-counter skincare products can be used as a preventative measure to treat rosacea symptoms and reduce the risk of flare-ups. Because rosacea prone skin has its own unique properties, including the potential for sensitivity, it’s important to use products that are either meant for sensitive skin or specifically formulated for those with rosacea. Many cleansers can dry out rosacea prone skin and increase irritation. However, gentle anti-bacterial and anti-inflammatory cleansers can reduce the symptoms of rosacea by reducing inflammation. We recommend using cleansers that contain ingredients such as sulfacetamide and sulfur to effectively cleanse rosacea prone skin, or cleansers that are specially formulated to not irritate sensitive skin. If you still notice irritation and rosacea symptoms from washing your face, try only washing your face once a day. Additionally, avoid aggressively rubbing or pulling on your face as you wash it, as these motions can irritate the skin. Moisturizers can prevent the burning, stringing, and irritation that often occurs with rosacea. Additionally, moisturizers can help the skin’s natural moisture barrier. Patients with rosacea often have a diminished moisture barrier, causing the skin to lose more water than normal and increasing the skin’s susceptibility to inflammation. Regular use of a moisturizer can rebuild this barrier and avoid aggravating the skin. Many brands carry moisturizers that are specifically formulated to soothe rosacea prone skin, including Paula’s Choice and Cetaphil. In general, moisturizers with ingredients such as ceramides and hyaluronic acid are effective for rosacea prone skin. Unfortunately, many common skincare ingredients can irritate rosacea prone skin, making symptoms worse. Avoiding these ingredients can reduce irritation and help keep your rosacea under control. Before using skincare products on rosacea prone skin, test it on an area of your skin such as your neck or chest. If irritation does occur in that area, you’ll know that the product cannot be used on your face. Testing for irritation in a confined area also makes it easier to cover up with clothing if irritation does occur. If irritation doesn’t occur, you’ll know that the product is safe to use. If behavioral modifications and over-the-counter products aren’t sufficient for treating your rosacea symptoms, the next course of action may be to explore prescription medication options. Depending on the severity of your symptoms, either oral antibiotics or topical medications may be prescribed. 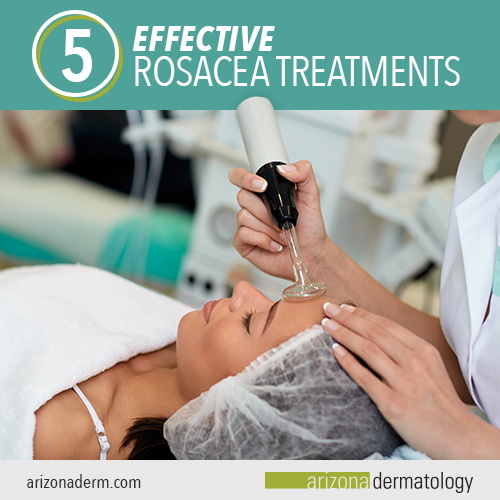 At Arizona Dermatology, we prescribe a number of industry leading and innovative medications to our rosacea patients. We understand that every case of rosacea is unique, and we work with our patients to find the perfect balance of medication. Note that depending on the case, the patient may have to try several options before finding the one that works best for their skin. Oral antibiotics are often prescribed for rosacea. In particular, antibiotics that include anti-inflammatory properties are commonly prescribed due to their ability to reduce redness, inflammation, and irritation. At a low, controlled dose, Oracea (a brand name of Doxycycline) acts as an anti-inflammatory and does not contribute to the risk of developing antibiotic resistance. Topical medications are applied directly to the affected areas and provide targeted relief from redness, bumps, and irritation. Topical medications are typically formulated as a gel, foam, or cream, and may be applied anywhere from one to three times a day. With consistent use, these medications can reduce the severity of rosacea symptoms. Mirvaso: A gel made from 0.33% brimonidine that diminishes facial redness. Metrogel: A gel made of 1% metronidazole and vitamin B3 that targets rosacea symptoms while helping the skin retain moisture. Finacea: A foam made of 15% azelaic acid that helps the skin renew faster and reduces papules and inflammation. Avar: A cream made from sodium sulfacetamide and a low amount of sulfur to target and suppress the bacteria associated with rosacea. Laser treatments use targeted beams of light to penetrate the surface of the skin and deliver clear results. Depending on the severity of your rosacea, several treatments may be needed before symptoms subside completely. Most patients have at least three treatments. During the course of these treatments, your dermatologist will work closely with you to determine how many treatments are necessary for the results you want. Vascular laser treatments target the small, dilated blood vessels that cause the flushing and redness associated with rosacea. At Arizona Dermatology, we use Candela’s GentleMax Pro laser system. This system uses Candela’s patented Dynamic Cooling Device ™ (DCD ™) technology to protect the skin with a cooling burst of cryogen, minimizing potential side effects and delivering the best possible result. Rhinophyma, the medical term for an enlarged, red, and bulbous nose, is a symptom often seen in rosacea patients. Most commonly, rhinophyma develops over the course of many years in response to untreated or poorly treated rosacea. Resurfacing laser treatments, otherwise known as electrosurgery, can diminish the excess swelling over several treatments. In this treatment, heat is used to remove excess tissue from the nose with a high-frequency electric current or a targeted laser. Whether you’re looking for answers to your rosacea questions or want to get started with treatment, the best thing you can do for your skin is to work with experts. 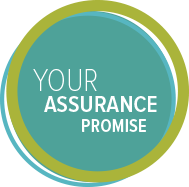 With decades of experience in diagnosing and treating rosacea, we’ll work hard to give you the results you want and make clear skin a reality. Contact us today to get in touch with one of our experienced doctors.